Salman Khan’s mega action entertainer, Tiger Zinda Hai, has been ruling at the box office. The high octane blockbuster has collected a total of 309.16 Cr crore nett and that is just in the first three weeks! Tiger Zinda Hai is also the highest grossing Hindi film of 2017. 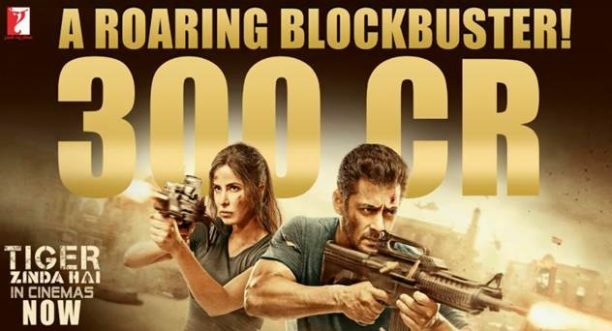 Directed by Ali Abbas Zafar, YRF’s Tiger Zinda Hai has been riding on incredibly positive audience reviews and it had shattered several box office records within the first week of its release. The massive feat of over 300 Cr in 3 weeks by Tiger Zinda Hai ensured that it made four new significant records. First, it’s the third Salman Khan film to hit 300 crore (Bajrangi Bhaijaan, Sultan and now Tiger Zinda Hai) – the most by any actor. Second, it’s the second YRF Production to make this feat (Sultan was the first one) – the maximum by any production House. Third, director Ali Abbas Zafar has two films in the 300 crore club, the maximum by any filmmaker to date. His first one being Sultan also starring Salman. Fourth – this is gorgeous Katrina Kaif’s biggest blockbuster to date. From the Biggest Ever Non Holiday Opening day record by a Bollywood film, to the Biggest Ever single day collection of 45.53 crore nett on Day 3, to the Highest Ever 3-day weekend, to the Biggest Ever 4-day extended Holiday weekend – Tiger Zinda Hai has set huge new benchmarks for the industry to chase. 16 queries in 0.672 seconds.